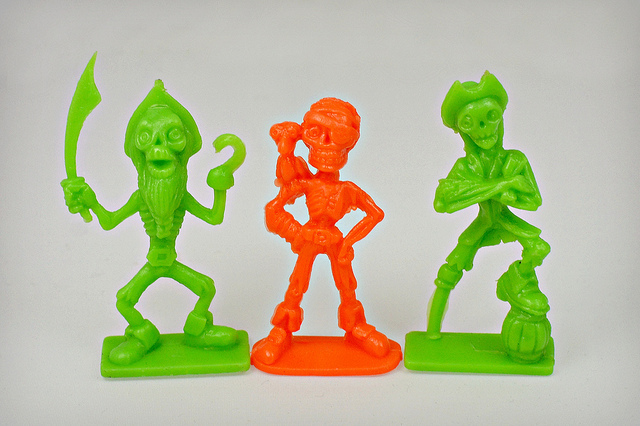 Here are some cool plastic skeleton pirate mono minis I got in a trade. You can't go wrong with a combination of skeletons and pirates. I believe they originated in Argentina and according to the collector I got them from, were fast food premiums from a place called something like "Patitas de Pollo." I haven't been able to find out anything more from a search though, such as if they have a specific name, exactly how many figures there were and when they were made. If anyone knows more, please leave a comment and let me know. I love those guys! I know nothing about them, but Skeletons + Pirates = Win!